Dr. David Jernigan, Biologix Center: Is taking oral Vitamin D and Statins a big mistake? Is taking oral Vitamin D and Statins a big mistake? If you drive down your cholesterol inappropriately, you will totally throw your overall health in the toilet! Cholesterol is not the enemy! Your body makes many of it's hormones out of cholesterol, including Vitamin D, which is not really a vitamin, but is a pro-hormone. There are not many good naturally occurring sources of Vitamin D in the food chain. This should be our first clue that we shouldn't need to take oral Vitamin D. Our body should make it easily, so why isn't our body making it? 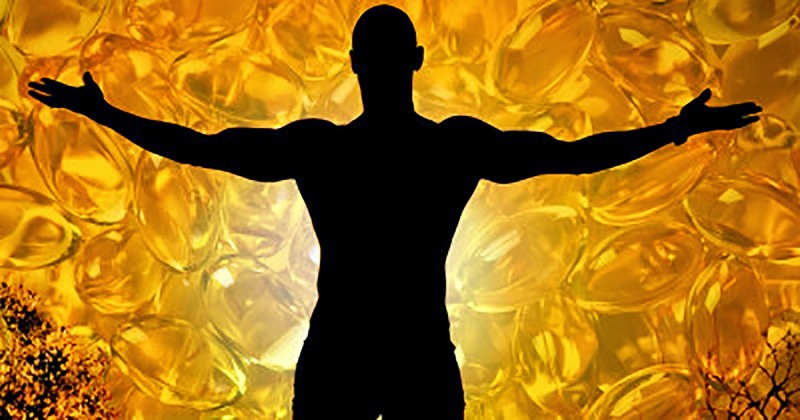 To answer questions on the problems that are occurring with the conversion of cholesterol into Vitamin D, we need to understand a bit of how important light is within the body, not just the light from the sun. The photoreceptors in the eyes gate the amount of light that enters the body. These photoreceptors are called rods and cones. Sixty-five percent of the cones only gate red wavelengths of light into the body, 30% gate green, and 5% gate blue light. From these cones we perceive all the colors of our world. However, light goes beyond just vision and travels through the Mueller cells in the eyes and enters the body itself, feeding and stimulating different tissues in the body based upon the type of wavelength of light. It is interesting to know that the body's information system is mostly biophotonic…practically fiber-optic. Neurologists know that a nerve impulse can only go 400 miles per hour at most, which is way too slow to be the operating software or the hardware that enables the instantaneous adaption and information processing that occurs each second in the body. We make energy in the form of ATP (Adenosine Triphosphate), an Adenosine molecule with three phosphate groups attached to it. To make energy our body will break off one phosphate group, which in the process of breaking off releases one photon of light and heat. We must stop thinking of the body as being just a chemical machine. The body is more like an incredibly sophisticated fiber-optic computer with quantum software. The software of the body can be corrupted through everything we put into our body. Pharmaceuticals, dyes, toxic personal care products, environmental pollution like smog, herbicides, pesticides, and even inappropriately prescribed natural medicines all hold the possibility of corrupting the energetic biophotonic software that runs the body. Cell phone microwaves, unshielded electric hybrid and electric cars, geo-engineering, and purposeful genetic manipulations of the population also need to be considered when discussing the onslaught of ways our software is being corrupted. To make vitamin D in the body you must start with cholesterol from your liver. The first step from Cholesterol to 7 Dehydro-cholesterol requires biophotonic light energy to add just one more bond to the second benzene ring at the bottom left of the molecule. Only then does sunlight add one more energetic bond to that same benzene ring on the 7 Dehydro-cholesterol molecule to form Vitamin D3. So we have two forms of light, biophotonic (light from the body) and light from the sun (UV) that are required in order to make Vitamin D.
The CPU of the body, the brain, senses that Vitamin D, which is not really a vitamin at all, but is actually pro-hormone D, is needed, and therefore keeps sending the command for more vitamin D. The body makes more cholesterol in response to the command but without the correct software it cannot be converted into the needed D.
So in this way we see that cholesterol will go higher as vitamin D is depleted. Remember this step is required before sunshine can do its part. This is why vitamin D will often be low even in people who get plenty of sunshine. Taking oral Vitamin D, while beneficial for certain if you cannot make your own, is bypassing the problems that need to be fixed in the body. It is treating the symptom...low vitamin D, instead of treating the breakdown in your body's ability to make its own Vitamin D. It is never good to do for the body what the body should do for itself. It is also likely that low vitamin D is a pretty good predictor that your body is low in many of it's Cholesterol-dependent hormones as seen in the chart below. 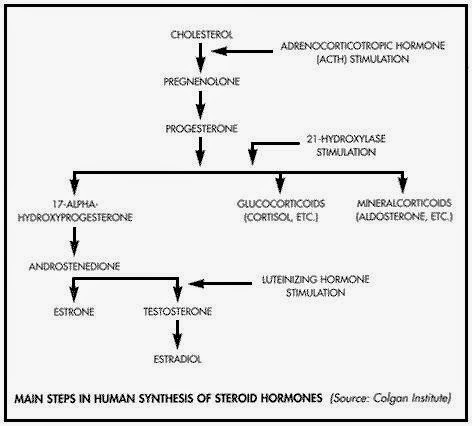 It is interesting to me that mainstream medicine is pushing more and more to drive cholesterol lower and lower, with Statin drugs, like Lipitor, and Crestor, when 75% of your cholesterol is made from your body in order to make your hormones such as progesterone, pregnenolone, estrodiol, testosterone, aldosterone, cortisol, the pro-hormone we call Vitamin D, bile, and more! Taking cholesterol lowering drugs are driving down all of your hormones that are required to be the man or woman you want to be, active, sexually alive, able to digest your food, have sustained energy, able to hand stress, able to sleep well, and wake up rested... If you don't care about these things, then continue driving down your cholesterol. They would have you believe that cholesterol is the enemy and that eating oatmeal and Special K is going to make you live longer! The inability to convert cholesterol into these hugely important substances is at the core of the most prevalent illnesses on the planet. So you see correcting the body's software is of paramount importance. Stay tuned for more on this topic. This is one reason our doctors at the Hansa Center have made so many advanced innovations to help correct the structure and function of these aspects of the body, in order to restore the biophotonic coherence in the body. Unfortunately it is not as simple as taking a pill or getting a shot, since it is a hardware problem AND a software problem. My vitamin D level is really low so my doctor is having me take 2000 mg Krill Oil daily to lower my cholesterol and Red Yeast Rice along with 5000 mg of D3. I'm 52 and get plenty of sun so based on your article it sounds like I should just be taking the D3 and not worry about as much about my slightly elevated cholesterol. So what do you do when you have high cholesterol because of heredity not because of life style? I take a statin for cholesterol and D3. While I like the hypotheses that Vitamin D is required within the body, and I understand that cholesterol is dangerous when levels are too low, could there be something within the microbiological systems within the body that has gone wrong? In other words, a rootcause that is not being addressed by supplementing what the systems of the body should be making naturally? Are we driving the system into a further depleted state by trying or control it through medication and man made "vitamins"